Keep your bedroom essentials within arm’s reach with the Ameriwood Home Core Nightstand. This nightstand is a convenient addition to your bedroom as it not only provides extra storage space, but the traditionally simple style and espresso finish works with any existing decor. This nightstand is constructed of laminated particleboard for a cost effective build that is both trendy and functional. The Core Nightstand has a bottom cubby that can be used to store books or magazines while the drawer offers concealed storage. Use the top surface to place a lamp on, or use it to display a few accessories for added style. 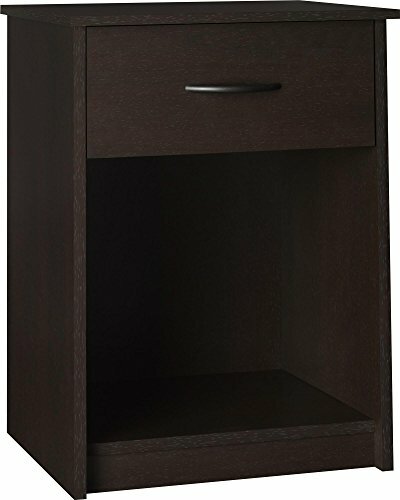 Core Nightstand is 24 1/8”h x 17 11/16”w x 15 5/8”d and is recommended to be assembled by 2 adults.